...that there are Cavemen in Sierra 117? This article is about the Phantom introduced in Halo 2. For other Phantom models, see Phantom. The Type-52 Troop Carrier, more commonly known as the Phantom by UNSC forces, is a troop carrier and gunship in service with the Covenant. They are used primarily as troop transports, flying into combat zones and deploying infantry while providing suppressing fire. 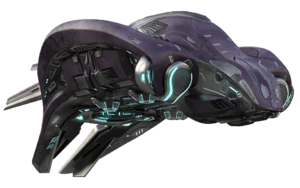 The Type-52 Phantom is one of the primary dropships in service with the Covenant. Introduced into the final year of the Human-Covenant War, the Type-52 Phantom was created by Assembly Forges to replace the earlier Type-44 Phantom. The interior of a Type-52 Phantom. The hull of a Phantom is nearly invincible to small-arms fire, although explosives can easily damage or destroy the dropship. The Type-52 Phantom is primarily composed of a curved central hull that features a closed operator cabin in the front and a twin impulse drive propulsion system that feature pivotal fins to control the direction of the thrust at the back of the Phantom. On either side of the dropship lie bay doors that can be sealed for exoatmospheric environments. At the bottom of the Phantom, there is a ventral gravity lift that is able to tow and carry vehicles to and from destinations or deploy passengers. The gravity lift and bay doors were created to allow quick and simple infantry deployment in nearly any terrain type or environment. A ramp is also attached to the dropship to allow passengers to simply walk off when the Phantom has landed. An intruder countermeasure system is also found on Phantoms. One of the Covenant's primary dropships, the Type-52 Phantom is capable of both infantry transportation and deployment in atmospheric and exoatmospheric environments. Despite being larger than the Type-25 Spirit, the Phantom is notably more maneuverable—capable of gracefully steering and weaving through tightly-cropped environments like narrow gorges, caverns, or urban centers such as a city with ease. The Phantom is roughly equivalent to the D77-TC Pelican in terms of function and performance. Phantoms are more heavily armed than the Type-25 Spirit dropship, sporting three defensive weapons that offer 360-degree turning radius. Jiralhanae soldiers aboard a Phantom. The Phantom crew consists of a pilot, a co-pilot, a navigator, and an operations officer who is in charge of the defensive automatic heavy plasma cannons. The Phantom can carry from as little as sixteen to as much as thirty "standard" passengers in its troop bay, depending on the personnel size of each model of the Type-52 Phantom. Generally, passengers are deployed from the ventral gravity lift and from the doors located by either of the dropship's large side doors. However, due to their size, Mgalekgolo soldiers are deployed from the Phantom through the use of its gravity lift. They have also been seen to transport teams of Huragok, which are carried in cases and swing from the Phantom's underside. 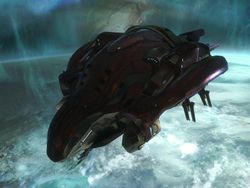 Like the Spirit dropship, the Phantom is capable of carrying a variety of Covenant vehicles such as two Type-32 Ghosts or a single Type-26 Wraith or Type-46 Spectre, as well as essential equipment such as deployable lookout towers, and components of anti-aircraft batteries by utilizing its gravity lift. Although Phantoms are rarely deployed in a gunship role, they are equipped with a large armament. The Phantom has several armor and armament configurations that vary depending on the model. Typically, Phantoms have a single heavy plasma cannon located underneath its nose and twin, with two side-mounted Type-52 plasma cannons attached to the dropship’s open bay doors. These plasma cannons are often operated by Unggoy soldiers. A second model replaces the heavy plasma cannon with a fully automatic one. Another model is armed with three separate, automatic, fully rotational heavy plasma cannons. A Phantom gunboat over Reach. An exoatmospheric combat variant of Phantom outfitted exclusively for space-based engagements, known as the Phantom gunboat, swaps its Type-52 plasma cannons for four plasma turrets mounted around the hull, and a chin-mounted heavy plasma cannon. While similar in design to the default Phantom, the gunboat is significantly larger in size and is equipped with energy shielding for missile deflection. The Fleet of Retribution used customized Phantoms following the Great Schism. These Phantoms were similar in function and appearance to the "normal" Phantom model, but they were colored an iridescent green instead of the usual purple, likely to match the UNSC's vehicle color schemes.These Phantoms were equipped also with cloaking technology, something rarely seen on ships of their size. After the Covenant's defeat, Type-57 Phantoms were used instead and the green color was replaced with a red color to match the color scheme of Swords of Sanghelios infantry. By 2558, at least one of the original green Type-52 Phantoms had fallen into the hands of Kig-Yar pirates on Ven III. Several other models of Phantoms exist, although they are essentially the same in both design and function. The troop capacity and armament of a Phantom varies depending on its model. One model that was present early in the Battle of Earth had three heavy plasma cannons. Phantom models that were present during the Fall of Reach and later in the Battle of Earth had only one plasma cannon. However, the Phantoms at Reach had a semi-automatic cannon, while the cannon on the ones at Earth was fully automatic. Glorious Advance - Used for a boarding action against the Infinite Succor. The role of the Phantom is to transport squads of Covenant troops and vehicles into a combat zone with speed and efficiency. While the T-25 "Spirit" Troop Carrier serves primarily as a dropship, the Phantom, with its heavier armament, also fills the role of a ground support gunship. As their hull is heavily reinforced, Phantoms are invulnerable to small arms fire. The Phantom has three defensive weapons, making it a more challenging adversary than the Spirit. Like the Spirit, the Phantom is mostly scripted to deploy troops and leave, sometimes without coming to a halt, though in rarer cases it may stick around to lay siege on the player. In Halo 2, the Phantom is invincible and can not be destroyed, although its weapons can be taken out, forcing it to retreat. The two silver engine plates can also be destroyed, although it will have no effect on the Phantom's speed. In Halo 3, Halo 3: ODST and Halo: Reach, the Phantom's three guns, the side doors and platforms, the engine plates, and its hind flaps, as well as its entire well being, are destructible. The Phantom's rear is most susceptible to damage, although this weakness was removed in Halo: Reach. When destroyed, the Phantom will float down, emit sparks and a loud whirring noise, then explode into wreckage, although in Halo: Reach the Phantom simply explodes. Taking down a Phantom is tempting to do so in Firefight or Campaign; however, it is unwise to do so if there are Phantoms traveling in groups, as they might pin you down with their plasma guns or in the most extreme cases, kill you. It is recommended to destroy the Phantom's armaments before taking it out, otherwise they may pin you down. If possible, stay under the Phantom and shoot at the drop-off zone where Covenant jump off. You can get a few easy kills with that. However, be wary of the plasma guns. Use a heavy weapon to destroy a Phantom. A Spartan Laser, the Warthog's LAAV guns, or a Rocket Launcher or a Fuel Rod Gun will do the trick. With heavy weapons like the Rocket Launcher or a Spartan Laser as well as mounted vehicle weapons like the Scorpion tank's cannon or an M68 Gauss Cannon. Aim for the twin engines (the silver parts on its front), as those are its weak points. However, the weak points are removed as of Halo: Reach. The Phantom is now destructible, vulnerable to heavy weapons and explosives. Nevertheless, it is very durable and able to take up to six shots from a Scorpion tank. The Phantom's hull is now a medium-dark violet in Halo 3, rather than magenta as it is in Halo 2. The Phantom's flight noise has been reduced from a loud buzzing to a low hum but the overall tone is pretty much the same. The Phantom fires shots that are now a blue color, rather than a vivid red. The Phantom can deliver troops by opening side doors, not just by the gravity lift. The Phantom no longer has three separate auto-cannons - they now have one chin-mounted auto-cannon, and two Type-52 Plasma Cannons on either side of the troop bay. The troop bay is open on both sides where the plasma turrets are and it is fully accessible by the player as they can leap into it before it takes off. The player is usually killed when the Phantom hits a death barrier. The main cannon's rate of fire is slower. The two upper tail-like parts in the rear of the Phantom appear smaller. A green-colored variant is introduced. The Fleet of Retribution variant is used by the Elites and has the ability to camouflage itself. The wreckage from its destruction is smaller to compensate for the Xbox 360's hardware capabilities. The Phantom can carry Engineers in pod-like cases. The Phantom's main cannon is equipped with a searchlight for night missions. The auto-cannon is replaced by a cannon that has a slower rate of fire and has a more explosive effect upon impact, similar to a Type-50 Concussion Rifle. The two front engine turbines no longer glow blue. There are no longer any "weak points"; it takes the same amount of weapons fire to destroy regardless of hit location. When hit by weapons fire, it no longer takes visible damage aside from the chin and side guns being knocked off. When destroyed, instead of having an "overload" phase where it drops and then explodes, the targeted Phantom instantly explodes as soon as it takes enough damage. Far less debris is left behind when destroyed; only the debris from the chin gun, the Type-52 Plasma Cannons on the sides, and a portion of the cockpit will be left when it explodes. Furthermore, not all Phantoms encountered are destructible. The Phantom has more health, capable of withstanding up to five M808 Scorpion shots before exploding. A variant outfitted for space combat, called the Phantom gunboat, is introduced. The Sangheili Phantom in Halo 3 resembles Romulan ships from Star Trek in both its lime-green color and its cloaking ability. In the E3 2003 Preview of Halo 2, the Phantom does not possess any form of gravity lift and the troops are instead dropped off from the back, similar to a Pelican. The Phantom is also capable of carrying a Spectre or a Wraith by using hooks located under its "belly". It also seemed to have only one Plasma Cannon. In Campaign Scoring charts, it counts as both a "Heavy" and a "Giant" vehicle. In the trailer for Halo 3: ODST, a Phantom is seen on patrol using two bright searchlights to sweep the streets. Oddly, the lights are located in the exact location as the Phantom's chin mounted gun, possibly meaning that this Phantom was specifically adapted for patrol or that its gun had a headlight mounted alongside it. In the cutscene where the Rookie receives a transmission from Dare, the Phantom that passes by has a searchlight mounted on the front turret. This headlight feature also appears in Halo: Reach. In the Art of Halo, there is a Phantom render for Halo 2 which had its side doors down and sported heavy plasma turrets on them. In the Halo Legends short film, Prototype, a Phantom is seen carrying a Wraith inside its troop bay, as opposed to hovering below it. This may be a means to protect the Wraith from being destroyed before it is deployed or it could simply be an oversight made by the artists. In Halo: Reach, a player can pilot a Phantom through the Flyable Pelican and Phantom easter egg. Unlike the Pelican, it can be destroyed, though unlike other vehicles it shows no outward indication of damage. In Halo: Reach's Firefight mode, the Phantom cannot be destroyed. In Halo: Reach's Firefight mode, a well-aimed M41 rocket launcher shot to the Phantom's cockpit can blast out the pilot (a Grunt), killing it and sending it spiraling out of the vehicle. When this happens, the Phantom stops and hovers for a few seconds before falling to the ground. Any personnel that are within the Phantom do not react and are not deployed. The underside of the early Phantom Dropship in the Halo 2 E3 Demo. An angled view of the Phantom as it appears in Halo 2. An in-game profile view of the Phantom in Halo 2. An angled render of the Phantom from Halo 2. A Phantom seen leaving a Covenant fleet around High Charity in Halo 2. The gravity lift of a Phantom from Halo 2. A Phantom dropping a Spectre in Halo 2. A view of the Phantom as it appears in Halo 3. Alternate preview of the Phantom Dropship in Halo 3. In-game profile view of the Phantom Dropship in Halo 3. Profile view of the Phantom Dropship from Halo 3. Underside of the Phantom Dropship from Halo 3. A front view of a Phantom. A Phantom escorted by two Banshees on Installation 00 in Halo 3. A Phantom carrying a Type-27 Mantis component. An in-game preview of a Fleet of Retribution Phantom Dropship with green color scheme. A Fleet of Retribution Phantom activating its active camouflage. A Fleet of Retribution Phantom exploding. A Phantom engaging a Pelican in 2531 from Halo Wars: Genesis. A Phantom, seen through the "eyes" of the Superintendent, using a pair of high-intensity searchlights to sweep the ruined streets of New Mombasa in Halo 3: ODST. A console in a Type-52 Phantom in Halo 3: ODST. Two Phantoms being loaded with troops in the hangar bay of a CCS-class battlecruiser. An alpha build of Halo: Reach, showcasing the Phantom. Turnaround reference of the Phantom as it appears in Halo: Reach. Alternate in-game preview of a Phantom Dropship in Halo: Reach. An in-game view of the Phantom Dropship in Halo: Reach. A view of the Phantom in Halo: Reach, on the level Nightfall. A side view of a Halo: Reach Phantom. A Phantom being teleported onto the Viery Territory. Noble Six shooting at a Phantom in Halo: Reach. A rough model of a Phantom, used in background battles. A Phantom participating at the Battle of Aszod. A Swords of Sanghelios Phantom on Ven III in Halo: Escalation. A model of the Phantom for Halo 2: Anniversary. Phantoms during the Raid on the Threshold gas mine. ↑ Halo: The Thursday War, page ?? ?